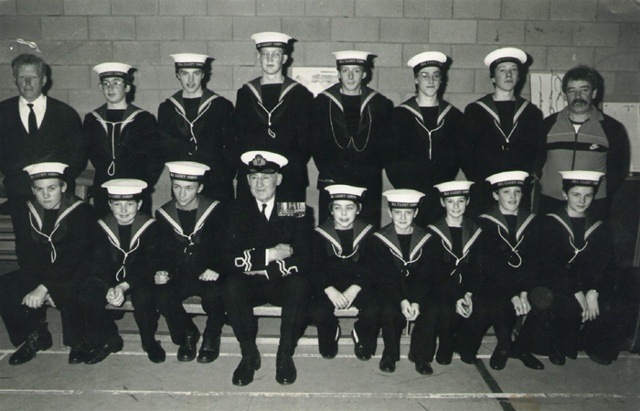 Here is a photograph, by Andrew Allan, of Invergordon Sea Cadets at South Lodge Primary School in either 1982, 83 or 84. Top row, from left: **** Pearson? ; **** ****; Norman Gaston? ; Colin "Foggy" Grey; **** Maclean; Alan Miller; **** ****; **** ****. Bottom row, from left: **** ****; Roderick Grey; **** ****; Jack Wilson; Brian Leonard; Ewen Young (me); James Guild; David Francis; Colin Ruddie. Someone may be able to fill in the blanks and/or confirm or correct the names I've question marked. I'm sure the guy second from the right, top row went by the nickname of "fleas". That's me, fourth from the right, bottom row. Joe McGhee at the far right of the back row? Mike Pearson top row 1st left. Hi Ewen, I seem to recall having been in the Boys Brigade or something when we were little. Any ideas? Fourth from left back row is Alan 'Tubey' Maclean. Boy 3rd right in front row looks like it might be David Cross or one of his brothers? Yeah, that's Joe McGhee (my dad) far right, back row. He still sports the same moustache! We now live in Huntly, Aberdeenshire. Think the boy 3rd in from left front row is Freddie Cross. I always get homesick when looking at this site. Wow, this pic takes me back - hard to remember my brother looking so young. Have already copied and forwarded to his daughters (he's gonna kill me!). That's him, Alan Maclean, back row middle, could have at least done his zip up. If I'm not mistaken, back row 2nd left is Stephen Reid. The guy top left is Mike Pearson. I was a S/Lt in the Invergordon Corps from 1985 to 1988.